One skillet meals are all about convenience, but they don't have to be short on flavor or full of empty calories. Do a quick image search and you're likely to find a massive collection of skillet dinners packed with potatoes, rice or pasta. While those are indeed comforting, there are other ways to get a well rounded meal in without the guilt. Pick a protein and a veggie (or a few!) and you're on your way to a satisfying weeknight meal. 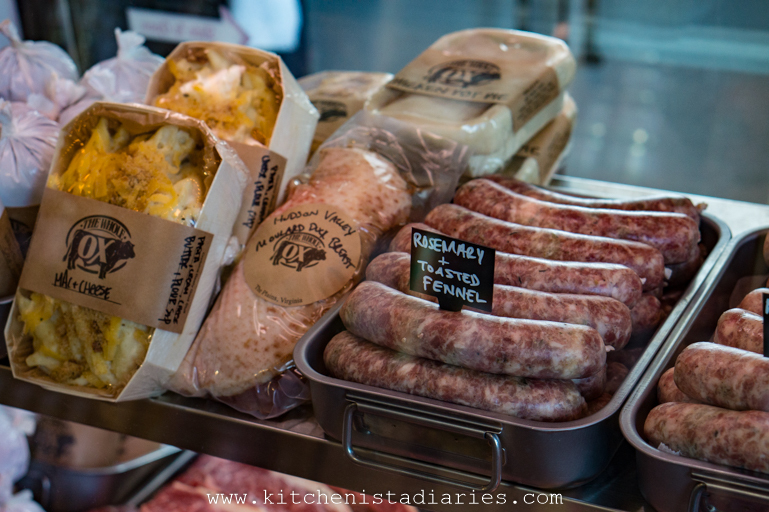 Sausage is a great option, because it's perfectly portioned, already seasoned and requires no additional prep work. When I'm on Whole 30, sausage becomes an especially wonderful treat as it's so difficult to find it made without sugar! There's a smoked chicken and apple sausage at my grocery store that my son and I enjoy and the only one I can consistently find that's sugar free (it's sweetened naturally with fruit.) 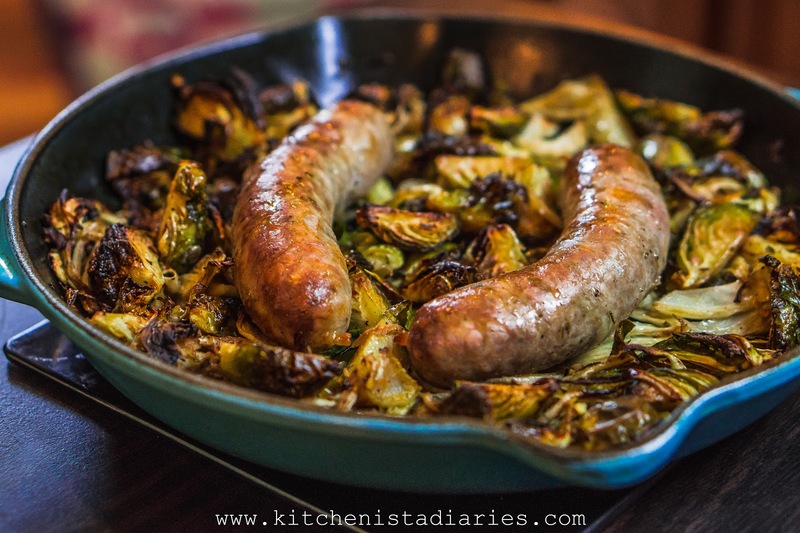 While precooked sausages will work for this dish, I really wanted the benefits of all that extra flavor you get in the skillet from cooking fresh links. 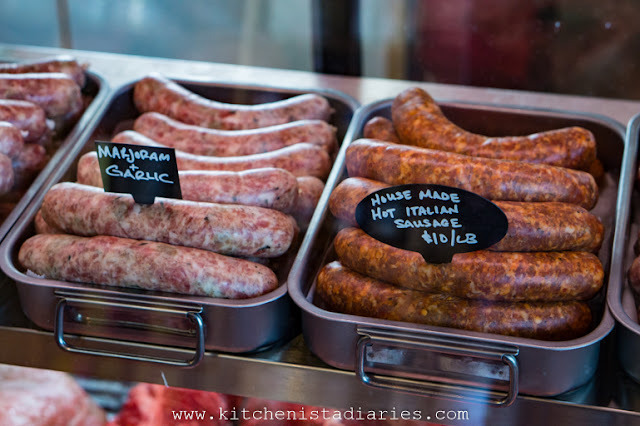 At a recent trip to my local butcher, The Whole Ox, I was delighted to see their current selection of fresh, house made sausages on display. And by delighted, I mean drooling. 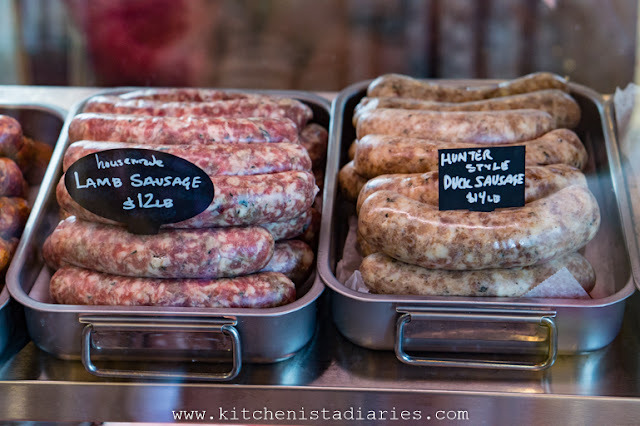 Hello, duck sausage. Even more exciting was the fact that several of the sausages were in fact made without sugar. For this dish, I chose a fresh Rosemary & Toasted Fennel pork sausage. I'll be back for that duck sausage in a couple weeks though! Once I had my protein, it was easy to pick a few complimentary veggies and seasonings to incorporate into my dish. 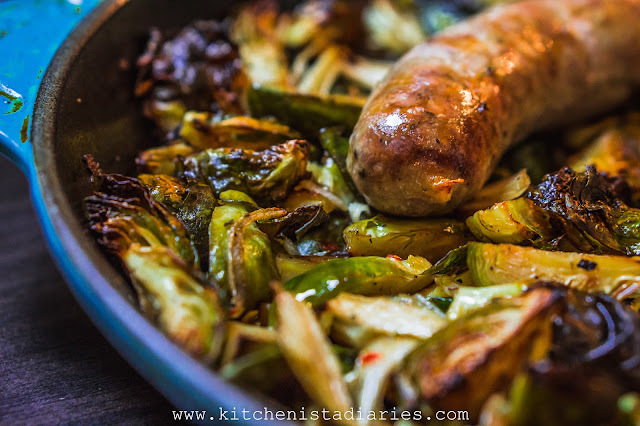 I'm a huge fan of a big home-style skillet of cabbage, onions and sausage, so for a new take I landed on onions, fennel and Brussels sprouts. Fennel and Brussels sprouts are both in season so it's a great time to take advantage. If you've only ever had Brussels sprouts boiled to death, consider giving them another chance. Roasting is my usual method of choice as I like the contrast between crispy outer leaves and tender cores, but I'm also a big fan of salads using raw or quickly sauteed Brussels sprouts. Brussels sprouts are packed with fiber, potassium, Vitamin C and folate, among other nutritional benefits! You can find them in your fresh produce section, usually bagged or loose in the bulk bins. Sometimes you'll even still find them on the stalk which would probably make for a cool holiday presentation. 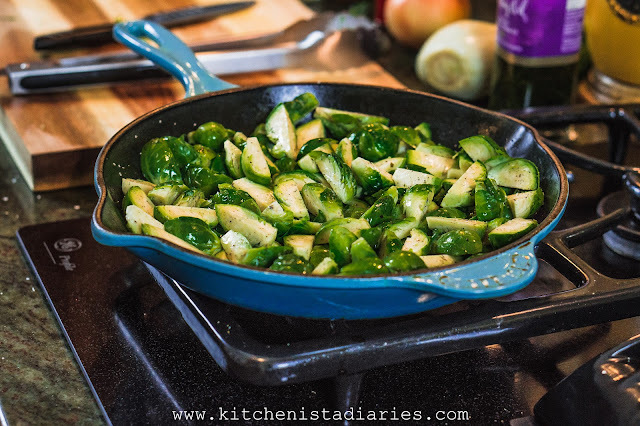 Add quartered Brussels sprouts to a preheated and oiled cast iron skillet and transfer to oven. Roast until edges begin to brown. Preheating the skillet while you prep your ingredients gives the Brussels sprouts a head start on roasting as soon as they hit the pan, ensuring that they crisp up before getting soggy. 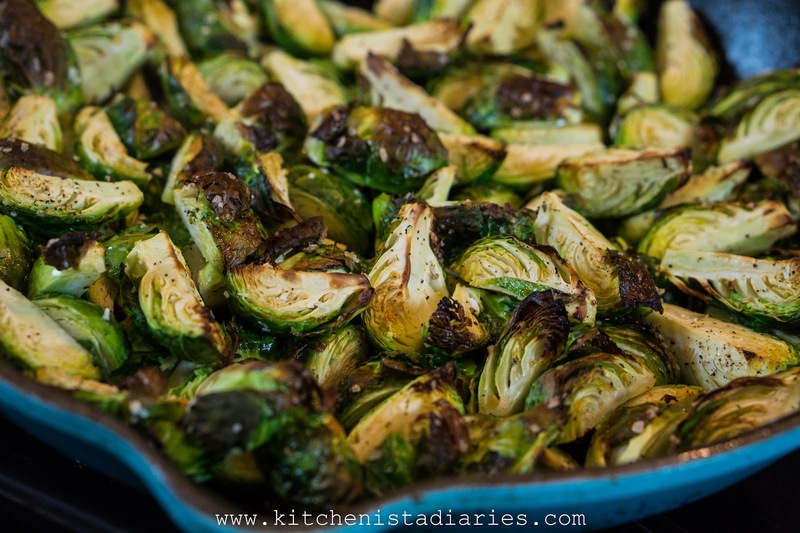 Transferring to the oven essentially allows you to pan fry the Brussels sprouts on the bottom while roasting the ones on the surface, for even browning. 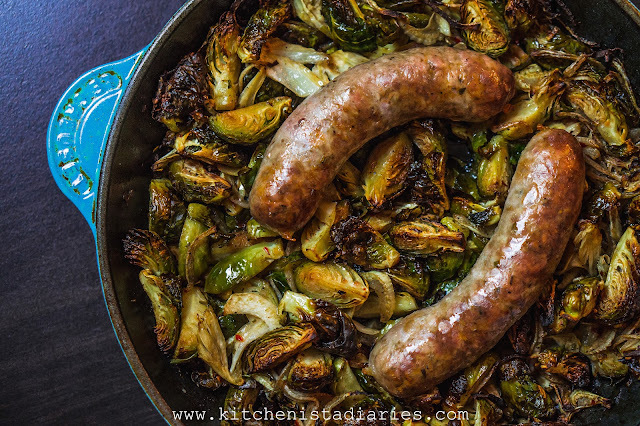 Roasting the Brussels sprouts on their own first gives them time to fully cook without overcooking the sausage. While Brussels sprouts roast, combine thinly shaved onion, fennel and balsamic vinegar with remaining seasonings. 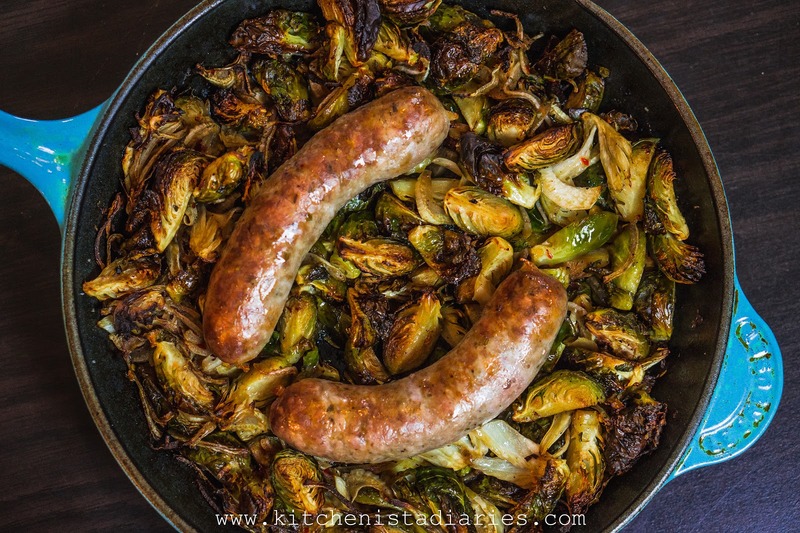 The bitterness of Brussels sprouts and fatty richness of sausage goes really well with a pickled element. 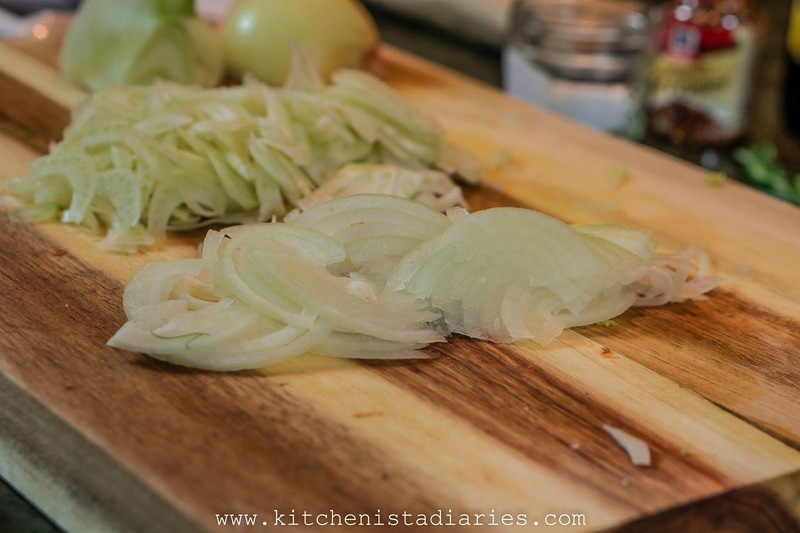 Shaving the fennel and onion and soaking for a few minutes allows them to absorb the sweet vinegar and cook quickly. 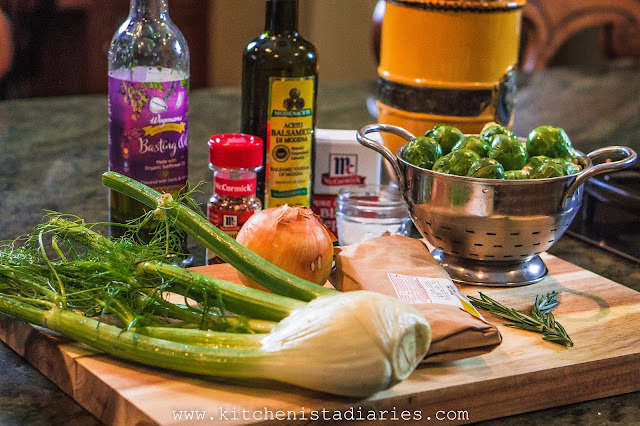 Once Brussels sprouts are half-way roasted, remove skillet from oven. Stir in the onion and fennel mixture and nestle sausages on top. Transfer back to oven and finish roasting until sausages are cooked through. Because all the remaining ingredients are prepped and ready to go, you won't waste time letting the skillet lose heat in the final step. The Brussels sprouts provide a bedding for the sausage links to cook gently while allowing some surface area on top to brown for optimum flavor. In a little over thirty minutes, you'll have a tasty one skillet dinner that is packed with flavor and nutrients! 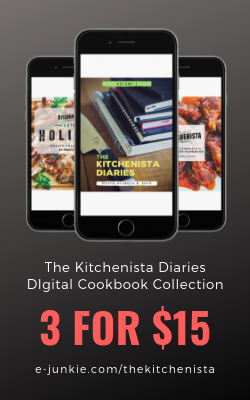 What's more, this three step process will be easy to modify with other ingredients to come up with a totally new dish using the same techniques. Although I definitely wouldn't blame you for returning to sausage and Brussels sprouts every time. This one's a keeper. Suggested Equipment: 10" cast iron skillet or other oven proof heavy skillet, instant read thermometer. A handheld mandoline is helpful. *Feel free to use your favorite savory sausage and/or a flavored cooking oil. I'm using a garlic & thyme infused basting oil. As long as it has a high smoke point (canola, grape seed, safflower or sunflower are all good choices) you can use it for this recipe. 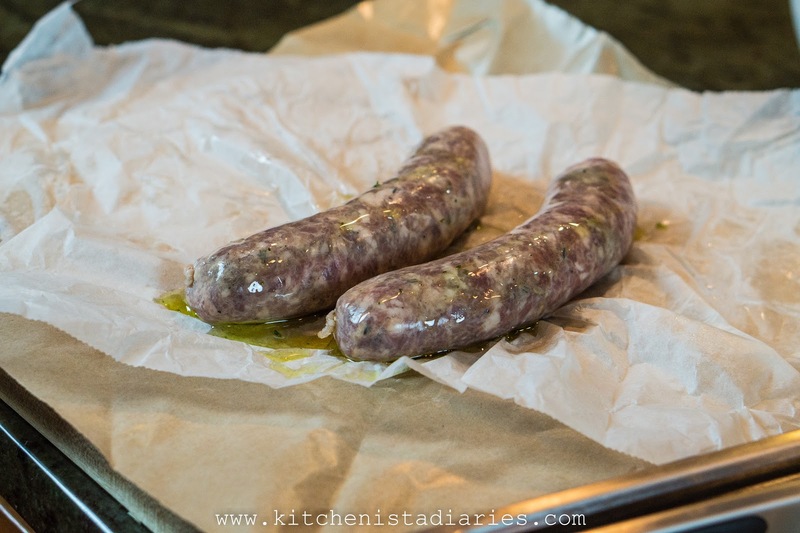 Likewise, sausages with a savory garlic and herb flavor profile will work well; think Italian or similar. Fresh pork, chicken or turkey sausages are all fine, unless you are lucky enough to find lamb or duck sausage! Before gathering ingredients, set your oven to 425° F and arrange a rack near the top 1/3 of the oven. Place your skillet in there to preheat while the oven warms. 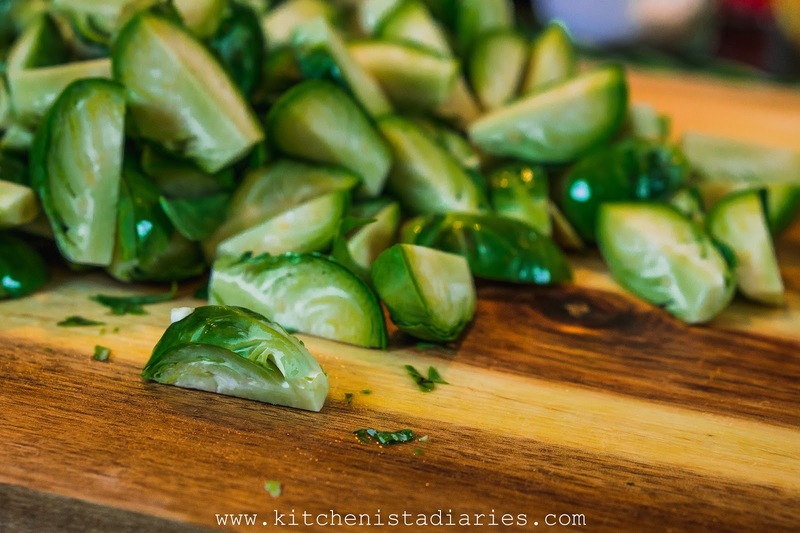 After washing the Brussels sprouts, trim any tough stem ends and slice into quarters. Carefully remove the preheated skillet from the oven and add a couple tablespoons of cooking oil. 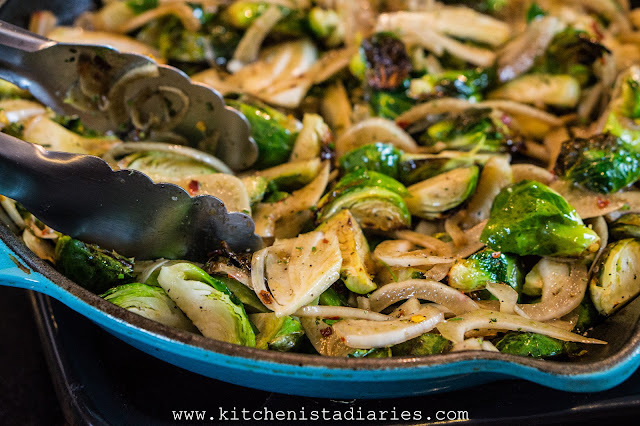 Swirl to coat the bottom of the skillet and add the Brussels sprouts. Season generously with salt and pepper and toss to coat evenly with oil. Transfer to the top rack of the oven and roast for 15 minutes. While sprouts roast, thinly slice the fennel and onion. A handheld mandoline makes this an easy job, but you can use a good chef's knife if you prefer. Tightly wrap the other half of your fennel bulb with saran wrap and refrigerate for use in another recipe! In a small bowl, toss the shaved fennel and onion with balsamic vinegar. Add the rosemary and pepper flakes and season with salt and pepper. Allow this to sit until the Brussels sprouts have roasted for fifteen minutes. Unwrap your sausages and drizzle lightly with cooking oil. Carefully remove the skillet from the oven and reduce temperature to 400°F. The Brussels sprouts should be nicely browned around the edges but still quite firm. 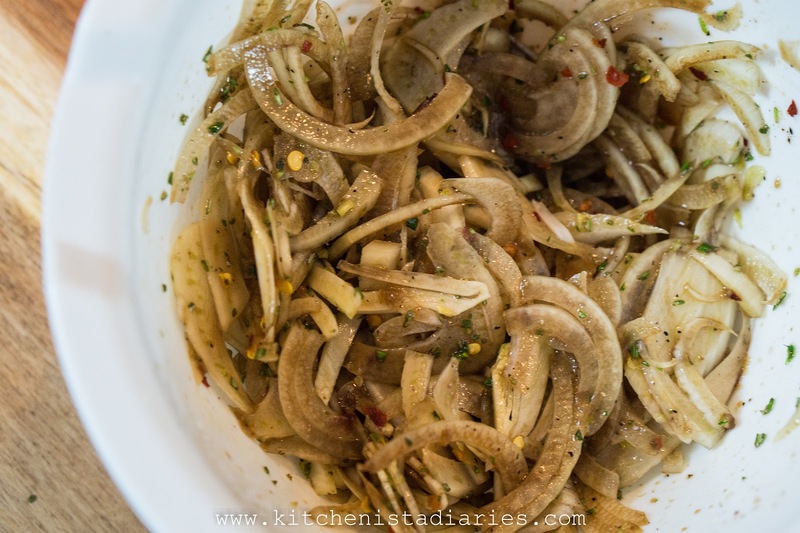 Add all of the onion and fennel mixture to the skillet and toss to evenly distribute. 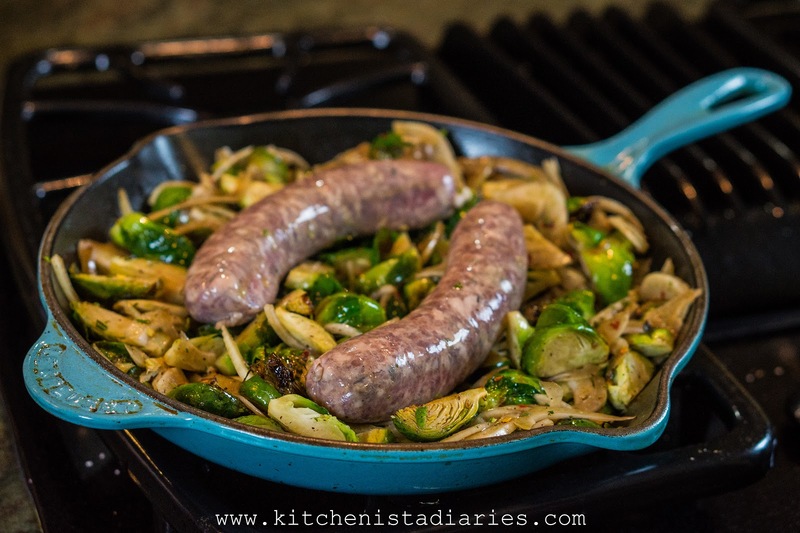 Nestle the sausage links in the center of the skillet; they should be elevated a bit by the Brussels sprouts. 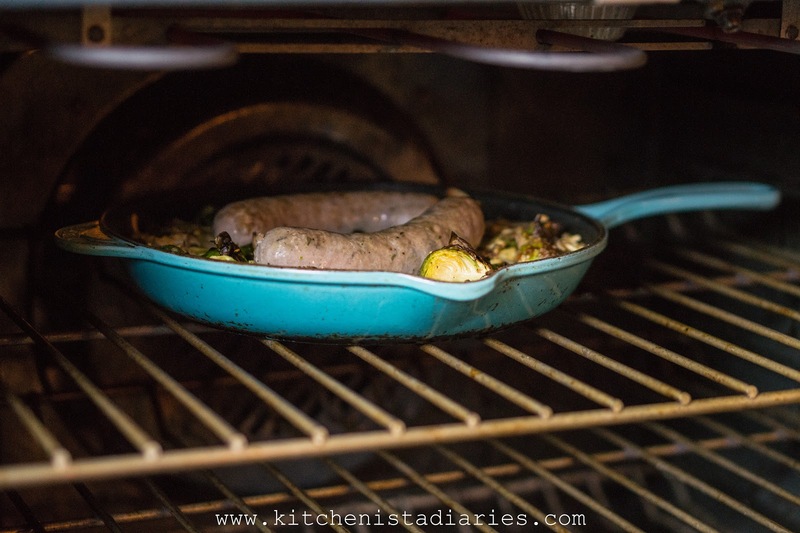 Return the skillet to the oven and continue roasting another 15 to 20 minutes, or until the sausage is golden brown and an internal temperature check reads 165°F. I don't think I have to tell you what to do next, so dig in! 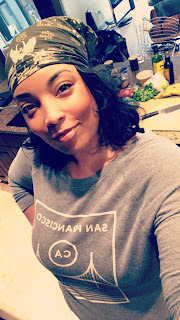 If you've found my cooking tutorials helpful over the years, you might be happy to know I'm launching an online cooking class! 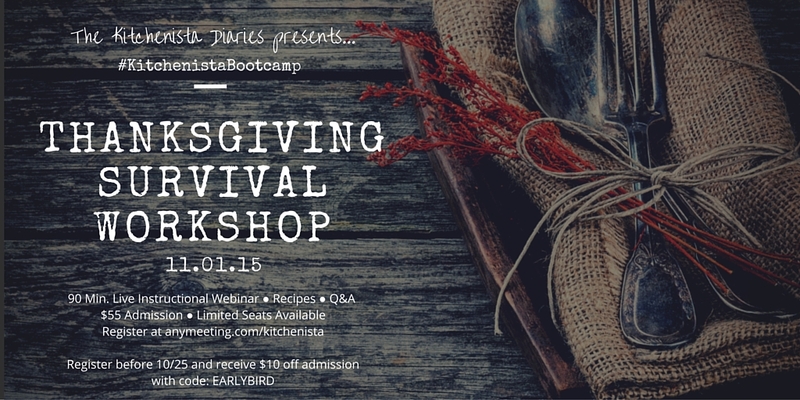 Head over to the #KitchenistaBootcamp tab to find out more and register for an upcoming webinar. 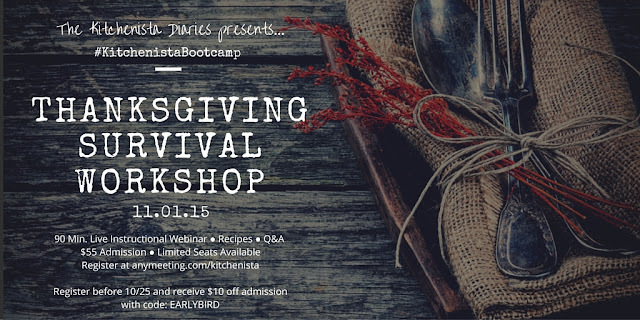 My Thanksgiving Survival Workshop is coming up first so hurry and register as seats are limited!